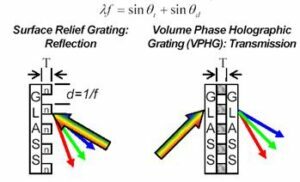 What type of diffraction gratings (a.k.a. gratings) does Wasatch Photonics manufacture? We make volume phase holographic gratings (VPHGs) recorded interferometrically in DiChromated Gelatin (DCG) sealed in glass. While there are many other optical recording media, DCG possesses the required combination of characteristics to produce very low polarization dependent loss (PDL), very high efficiencies, and wide bandwidths. These translate into benefits that enable telecom and other companies to leverage and capitalize on their own technologies. How does your Volume Phase Holographic Grating (VPHG) technology differ from surface relief grating technology? VPHGs, have a constant thickness (T) with a periodic, typically sinusoidal, change in refractive index (n). Surface relief gratings have a periodic change in thickness with a constant refractive index. Most VPHGs are made in transmission geometry while most surface relief gratings are made in reflection geometry. Master VPHGs can usually be made for spatial frequencies >900 lpmm. These master VPHGs may be copied optically without either the master or copy VPHG degrading over time. Since surface relief masters are copied mechanically, both the surface relief master and copy will degrade over time as the number of copies increases. What are some of the other properties of VPHGs? VPHGs possess low stray light and low absorption in the visible and NIR. They are sealed in glass making them long-lived, easy to handle, scratch resistant, and easy to clean. VPHGs usually have anti-reflection (AR) coatings applied to one or both surfaces to minimize Fresnel reflections and increase overall output. How do you clean VPHGs? VPHGs, whether they are AR coated or not, can be easily be cleaned just as you would any other glass optic to remove fingerprints, dust, and contaminants. Use the standard optics cleaning method of “drop and drag”. Gently wipe the grating with a clean, lint-free cloth/wipe using acetone or alcohol without much pressure; reagent-grade methanol or Windex may also be used. Do not use MEK, polishing compounds, etc. Hard rubbing with such chemical or polishing compounds may damage the AR coating. AR coated surfaces will pass the “Scotch Tape” test. What information is available on your gelatin recording medium and is it stable over time? Our gelatin recording medium is very similar to the gelatin that has been used in the photography industry for more than 100 years. As you may know, properly processed photographs are very stable and will retain their properties for decades. One of the major reasons for this excellent stability of photographs is the stability of the gelatin base. The discoloration of very old black and white photographs is a result of insufficient removal of fixer from the paper base, which results in a yellowing of the paper. It has nothing to do with the gelatin. Wasatch Photonics uses a dichromated gelatin (DCG) mixture as its recording medium of choice. Once this mixture is processed and the chromium removed, it is essentially pure gelatin and is very stable. During the past thirty years, there has been no measurable degradation in gelatin gratings that are properly sealed. The DCG holographic scanning disks used in some of the early optical bar code scanners still function exactly as they did over 20 years ago. What is a Dickson Grating® and why is it different from other gratings? A Dickson Grating® is a highly specialized volume phase transmission grating. It can diffract both orthogonal linear polarizations with equal and high efficiency at included angles greater than 90 degrees over 40 nm bandwidths. Other gratings designed to be used at these high diffraction angles will have much greater PDL, lower diffraction efficiency, and a greater variation in diffraction efficiency across a 40 nm bandwidth. The 40 nm bandwidth and favorable high dispersion angles combined with efficiencies near 95% make the Dickson Grating® highly desirable for Telecom applications such as Mux/Demux/Remux, OSA, monitors, filters and Raman Spectroscopy. The grating is named after the grating designer, and Wasatch Photonics Co-Founder, Lee Dickson. What kind of performance characteristics can be expected from a Dickson Grating®? Can gratings with different dispersion angles be made? VPHGs can be made at almost any angle. Dickson Gratings® perform in narrow angular ranges, it is this limitation that allows them to work as well as they do. There are however two classes of realizable Dickson Gratings® with the first working near a half angle of 46.5 degrees in air and the other working at internal angles too high to escape from a flat substrate which must therefore be used with prisms. This latter design is termed the Dickson Grism® and has nearly TWICE the dispersion per pass of a Dickson Grating®. In January of 2005, we delivered samples of our latest high dispersion product, the Dickson 1350® for 1525-1565nm which produces >2 times the dispersion of a 940 lpmm Dickson Grating®. Over what wavelengths can your gratings operate? We cover 350 – 2400 nm (the entire visible range and NIR) with a selection of glass substrates and prisms. What Physical sizes can be made? Typical ruggedized sizes with perfect hermetic seals begin at approximately 20 mm x 30 mm. Smaller sizes have to be externally sealed. Gratings as large as 400 mm x 400 mm have been made by the Wasatch Photonics team. What wavefront uniformity/distortion can be expected? 1/4 wave is typical. We can offer very low wavefront error with a Dickson Grating®. What environmental tests have been performed on your gratings? Our telecom-grade, epoxy sealed gratings have survived boiling water for several days with no degradation and 95° C at saturated humidities for more than 2 weeks. A collapse of the grating structure has been observed after several days at 120° C. Some of our similar, but non-Dickson design, gratings are currently in commercial multiplexers and are surviving real world tests as well as having passed standard compliance testing. The DCG is hermetically sealed between various substrates such as BK-7, Borofloat, low iron sheet glass and fused silica, making it impervious to everything but extreme heat. What are the thermal and aiming characteristics? Aiming stability over time and temperature is completely dependent upon the substrate used. Near zero drift is obtained by using a substrate with a low thermal coefficient of expansion (TCE) such as fused silica. How is DCG affected by DWDM and input signal conditions? There is hardly any absorption in a phase grating. The more common reflection gratings absorb as much as 20% and get really hot. It is not uncommon for communication signals to be between 5 and 50 mw, so adding up a hundred or more channels is a lot of heat. The gratings can take the heat but the losses at the fiber ends will be measured in watts, so heat dissipation probably has to be considered in a device’s package. Total absorption and scatter in the grating is about 2 or 3% so it is not a problem. Depending upon the glue, it can begin to soften or degrade between 10 to 100 watts per square cm continuous wave. Properly hardened gelatin can withstand >100 watts per square cm continuous wave. Peak power from pulsed laser energy applications can have energy densities in the megawatts. Is grating performance affected at temperature extremes or as a result of temperature cycling? Test results over a temperature range of 0-100°C indicate no significant change in efficiency, <0.5%, for a typical Dickson Grating®. Gratings can also withstand repeated temperature cycling with no measurable degradation in performance. Are your gratings affected by radiation? The effect of high energy radiation on gelatin is also important to anyone intending to put DCG HOE’s into space or into solar collectors outdoors or into creative lighting designs in buildings where the windows are DCG gratings. Gelatin, like all organic and many inorganic substances will be damaged by photons of more than 4 or 5 electron volts. Eventually all the bonds will be broken if the flux and energy are high enough for long enough. The gel will then be decomposed into loose atoms and molecules incapable of maintaining the original physical form. Fortunately the process takes a very long time to complete, if the gel is protected between two pieces of glass. We have tested holographic scanners sandwiched between two pieces of 1.5 mm thick glass by placing them near a 250 watt low pressure mercury arc lamp for over 24 hours or until the glass itself solarized and became dark near the exposed surface. The gelatin was unchanged in diffractive properties but the glue line and the gel were slightly yellowed which would reduce transmission in the blue region. Less severe tests on display holograms were carried out from 1977 to 1979 where the test pieces were placed out in the open to take on whatever the weather in Salt Lake city and also in New Jersey could dish out. In all cases, for a year or for a month, the glue that we were using then became noticeably yellow but the gelatin and glass remained unchanged within the limits of our ability to measure it optically. Holographically recorded gratings normally have a special efficiency dependence across the grating caused by a laser’s Gaussian beam profile. Do your holographic gratings have this spatial dependence? We have developed novel techniques that significantly reduce variations in diffraction efficiency across our gratings. How can I externally trigger acquisitions on my OEM spectrometer? See our Triggering Tutorial for examples in ENLIGHTEN, LabVIEW and more! How can I change the excitation wavelength or other EEPROM fields in ENLIGHTEN? Read how in our guide to ENLIGHTEN’s EEPROM Editor. What is the minimum & maximum integration time for the Cobra-S OCT spectrometer? The minimum integration time for the Cobra-S spectrometer is 1.3 μs. The maximum integration time is 655.35 μs. How do I set up my Cobra OCT spectrometer? Detailed instructions, a summary of data flow, and camera link commands can be found on our guide, Cobra Spectrometers: Getting started. How can I work with my Cobra OCT spectrometer in LabView? How do I communicate with e2v Octoplus camera?